The lateral transfer of photosynthesis between kingdoms through endosymbiosis is among the most spectacular examples of evolutionary innovation. Euglena, which acquired a chloroplast indirectly through an endosymbiosis with a green alga, represents such an example. 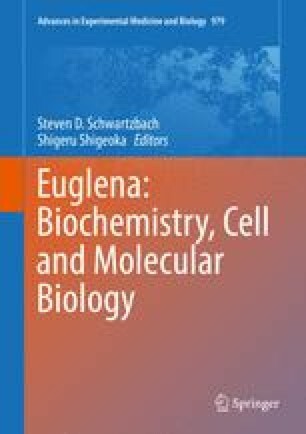 As with other endosymbiont-derived plastids from eukaryotes, there are additional membranes that surround the organelle, of which Euglena has three. Thus, photosynthetic genes that were transferred from the endosymbiont to the host nucleus and whose proteins are required in the new plastid, are now faced with targeting and plastid import challenges. Early immunoelectron microscopy data suggested that the light-harvesting complexes, photosynthetic proteins in the thylakoid membrane, are post-translationally targeted to the plastid via the Golgi apparatus, an unexpected discovery at the time. Proteins targeted to the Euglena plastid have complex, bipartite presequences that direct them into the endomembrane system, through the Golgi apparatus and ultimately on to the plastid, presumably via transport vesicles. From transcriptome sequencing, dozens of plastid-targeted proteins were identified, leading to the identification of two different presequence structures. Both have an amino terminal signal peptide followed by a transit peptide for plastid import, but only one of the two classes of presequences has a third domain—the stop transfer sequence. This discovery implied two different transport mechanisms; one where the protein was fully inserted into the lumen of the ER and another where the protein remains attached to, but effectively outside, the endomembrane system. In this review, we will discuss the biochemical and bioinformatic evidence for plastid targeting, discuss the evolution of the targeting system, and ultimately provide a working model for the targeting and import of proteins into the plastid of Euglena.